The FIFA FUTURO III course is underway in Auckland this week. Further development is on the horizon for match officials in Oceania as referee technical instructors, referee fitness instructors and futsal referee technical instructors from across the region gather in Auckland to upskill at the OFC FIFA FUTURO III course this week. OFC-based FIFA Technical Instructors Kevin Stoltenkamp and Neil Poloso have been joined by FIFA Technical Instructor Mohd Salleh Subkhiddin, AFC-based FIFA Fitness Instructor Alejo Perez Leguizamon, FIFA Fitness Instructor Kader Touati, FIFA Futsal Instructor Perry Gautier and FIFA Referee Coordinator Dominic Chielens in leading the 40 participants through three separate courses running consecutively at AUT Millennium and Massey University. 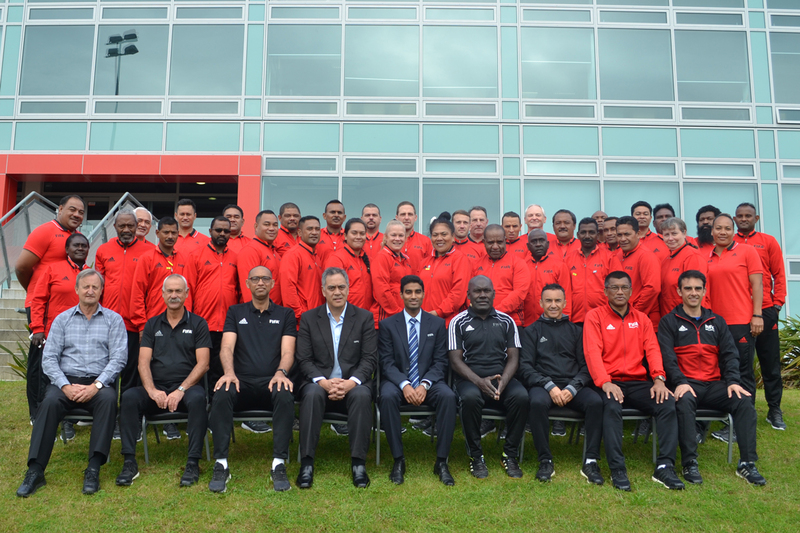 Although the seven instructors are imparting knowledge from their different areas of expertise, they all share the same objective – equipping the member association referee instructors with the right tools to upskill match officials and integrate FIFA refereeing standards and procedures across the region. “What we’re trying to do here is get consistency. At the moment we’re getting different interpretation of laws and by having people here from all over the world who specialise in this, we’re giving instructors the right information so that they can go back and impart that knowledge,” Stoltenkamp said. “We’re going through procedures to make sure there’s a uniform approach to testing and training referees in the region,” Leguizamon added. “The objective of the course is that the participants pass on this information to the instructors and referees in their associations. This is our biggest objective. The course is based on a teach-the-teachers concept,” Chielens added. Finding mutual understanding among the diverse cultures and codes has proven a challenge throughout the course so far but by adapting and delivering content to meet the unique needs of each member association, the team of FIFA Instructors have already received a positive response from participants. “We need to adapt our content to Oceania because there’s so much difference between the region’s member associations. The methodology of training between New Zealand and Solomon Islands is totally different, as an example,” Touati said. “We have a diverse range of experience and qualifications but that’s the whole point of this course. We want to standardise some of the basic procedures so the referees can have a fairly uniform approach,” Leguizamon added. After two days of active participation and integrated learning in all three of the courses, Stoltenkamp is feeling confident about the course’s success and the impact it will have on refereeing – and the game overall – in Oceania. “The benefit of this course is that all instructors are well-informed and passionate in what we’re trying to achieve – at the end of the day we’re all here for the match officials,” he said. The OFC FIFA FUTURO III Course will run until Saturday 2 September.